PAINESVILLE – In continued remembrance of Veterans Day, Elm Street Elementary welcomed a special guest speaker - veteran, author and professor - Dr. Robert Snyder to speak to students Nov. 14. Snyder has written two books on kids and veteran parents, and is currently a professor at Slippery Rock University. In addition to Snyder, the school welcomed eight soldiers from the Ohio Army National Guard and two Coast Guardsmen from the Fairport Station. The students were also given a tour of military vehicles from Ohio National Guard 838 Military Police Unit and a boat from Fairport Harbor Coast Guard Station. The school offered special thanks to its very own veterans at Elm Street, teachers Jen Roberts and Keith McCrory for their service prior to becoming teachers at Elm. The school also thanked second-grade teacher Kristin Haavisto for coordinating the special Veterans Day assembly, and for her husband’s continued service in the U.S. Armed Forces. 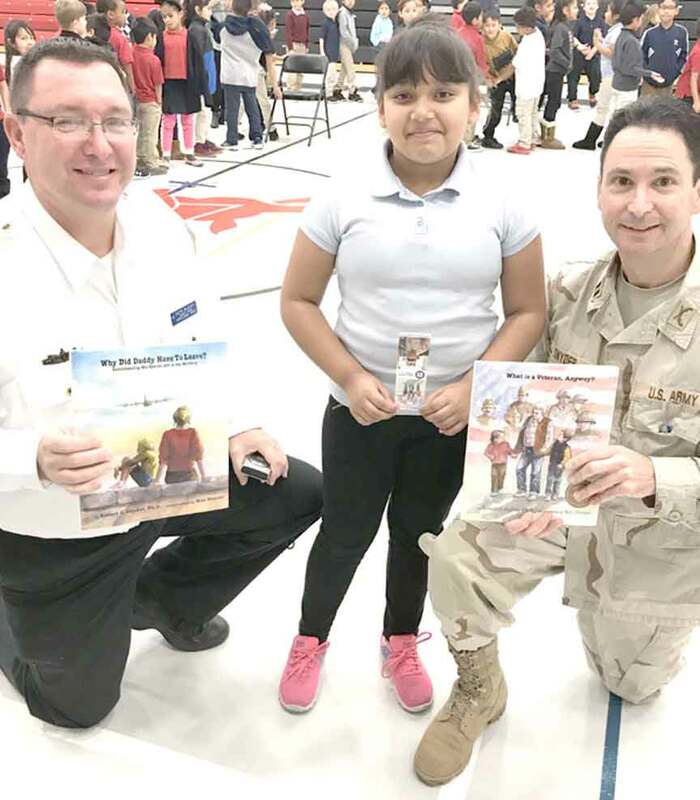 Dr. Robert Snyder shares his book titled, “What is a Veteran, Anyway?” with Elm Street Elementary second-grader Nashla Razo and teacher Keith McCrory during a special Veterans Day event Nov. 14.